Wholesale Solar carries high quality battery boxes for off-grid and battery backup systems from a number of manufacturers including Midnite Solar, DPW, and Radiant Solar. We can size and recommend a battery enclosure for most applications based on the number of batteries and size of each battery in a battery bank. Most of our customers are using MidNite’s indoor battery enclosures such as the MNBE-D, below. Midnite’s MNBE-D enclosure holds (8) UPG UB-GC2 batteries. The MNBE-D enclosure can accommodate (8) golf cart or group 31 size batteries. With the optional third shelf the MNBE-D will hold (12) group 31 batteries. Other batteries may fit depending on the dimensions, contact one of our experienced sales technicians for help picking a battery enclosure. Gone are the days of rickety homemade plywood battery boxes. We're pleased to carry purpose-built battery enclosures of every shape and size from MidNite Solar. These stackable enclosures are easy to assemble and come with instructions. Its powder-coated steel construction comes with a lockable door. 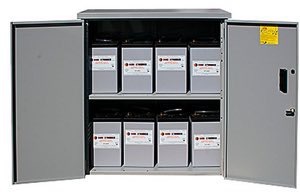 You can combine these battery enclosures with an E-panel and an inverter to form a great little backup system, or purchase one of our professionally-built Backup Power Systems.